Performers and audiences benefit from the proximity between stage and the back row, making it an ideal venue for intimate performances, as well as larger productions. Parade Theatre is located at NIDA on Anzac Parade in Kensington, Sydney. As the largest of the theatre spaces at NIDA Theatres, the Parade Theatre offers seating for audiences of up to 707 people in its three-tiered, horseshoe-shaped auditorium. 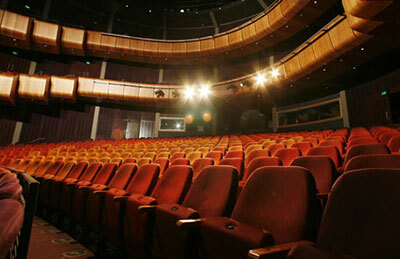 The Parade Theatre is suited for fully-staged productions, award ceremonies and presentations. Its full seating capacity is accommodated in a three tiered horseshoe-shaped auditorium for audiences of 397-707 people. The Parade Theatre’s stage surface is made of 6mm Masonite, with a concrete rear stage and wings. All stage surfaces are painted black. The stage is not raked and its maximum loading is 7.5 Kpa.